Often called beauticians, makeup artists are in demand these days due to booming glamour and television industry. Curious to know what does a makeup artist do? Well, a make-up artist is a professional artist that uses mediums applied to the skin to transform or enhance the appearance of a person. 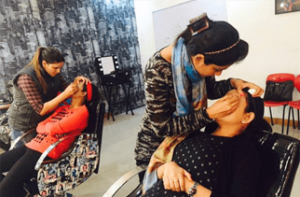 Recent decades have seen an increase in the demand for skilled make-up artists to work with production houses, theater companies and for television and movies. A make-up artist is usually a member of a team including hairdresser and wardrobe specialist. As part of this team, the make-up artist works to transform the actor into the character. Here is a peek into what does a makeup artist do? Makeup artists working in salons and beauty shops can prepare a person for special events like weddings, debuts and other special occasions by hiding flaws and highlighting her best features through the use of cosmetic products and application techniques. Fashion makeup artists, on the other hand, know how to apply makeup to fashion models so they will look stunning in pictures. For models who are going to walk the runway during fashion shows, makeup artists collaborate with the designer who decides on the look for all models. For instance, if the designer wants a mystical theme for his fashion show then the makeup artist will make each model look supernatural, taking into consideration the effect that is given when stage lights hit the model’s faces. Makeup artists working in the film industry, meanwhile, don’t necessarily have to make their subjects look pretty. Rather, the emphasis is on applying makeup that will make the actor look like the character he or she are meant to play. If an actor is supposed to play the role of Albert Einstein or some other famous figure in history, makeup artists know exactly what to do in order to create an exact replica. Some are so talented that they can make young actors look older and transform male actors to females and vice-versa. As a make-up artist your job would be to create the look that your client needs. This could include anything from a natural look for TV to using wigs and hairpieces for period dramas. You may also be required to apply special effects or prosthetics such as false noses or bald caps. You could work alone, as an assistant to a senior colleague, or as part of a larger hair and make-up design team. removing make-up and keeping wigs and hairpieces in good condition. You would work closely with production designers, costume designers, camera and lighting crew, and performers. Professional make-up artists can also work as columnists and editors for fashion and style magazines/websites. an interest in current and historical fashions. Also Explore Just Designs Institute Makeup Artistry Courses.